"A new archive from Late Antique Egypt. 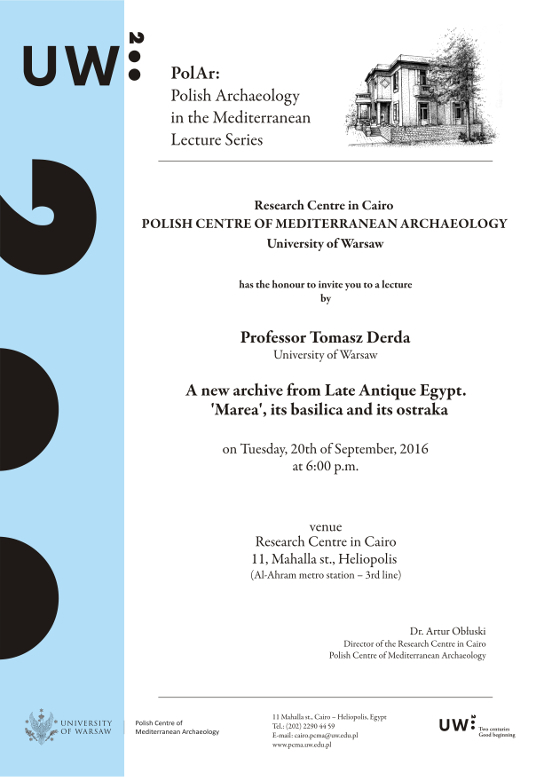 ‘Marea’, its basilica and its ostraka"
Tomasz Derda is the head of Department of Papyrology at the Institute of Archaeology, Univ ersity of Warsaw as well as the deputy director of the Polish Archaeological Expedition to Deir el-Naqlun monastery in Fayum Oasis. He published numerous articles and books important for our understanding of the Roman administration in Egypt. “The main subject of my presentation is an ‘archive’ of documents written on potsherds (ostraca), discovered in ‘Marea’, a site on the southern shore of Lake Mareothis, ca. 45 km west of Alexandria. In the title the name of the site is in inverted commas, since its identification is far from clear. Another word, namely ‘archive’, should also be written in the same way for reasons which I will explain.